Most property managers, facility managers, and superintendents take their potable water system for granted unless there’s an obvious problem, like water spots on ceilings or low water pressure. Unfortunately, water leaks from corroded pipes can cause lots of damage in a short about of time. This is why it is important to understand the operating conditions of your plumbing pipes along with their expected useful lives so that you can perform timely plumbing maintenance. Large Potable Water Pipes – Large water supply pipes are 2” to 4” in diameter. They span from the municipal water system at the street to the building. Medium Potable Water Pipes – Medium-sized water pipes can be found inside the building, usually in the walls. They are typically 1” to 2”, depending on their function. Small Potable Water Pipes – Small water pipes are less than 1” in diameter. They can be found connected to sinks, toilets and other water-using appliances. 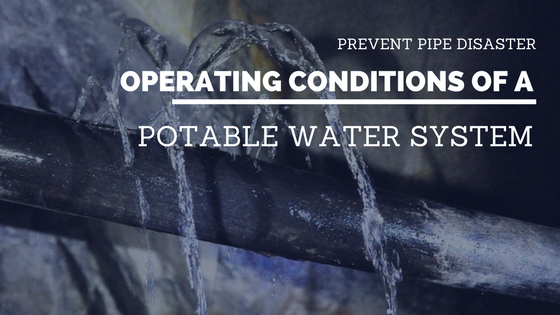 The operating conditions for potable water pipes vary according to the size of the pipe. Large water pipes operate under high pressure. Their size means they move large volumes of water, but they do so at a lower velocity. When these pipes develop leaks or completely rupture, they can spill a lot of water in a short period of time. Signs of a large water pipe break include soft, spongy spots in on your property. Puddles on the ground when there hasn’t been any rain and low water pressure inside your building. Medium water pipes operate under high pressure, and they move a lot of water. They also tend to be hidden behind walls, in ceilings, and in floors, making them hard to inspect and repair. The 2” medium-sized pipes are typically used as risers to transport water between floors. The 1” medium water pipes are used to transport water horizontally across the floors and into individual units. Since these water pipes are under a lot of pressure and transport a lot of water, breaks, ruptures and pinhole leaks can lead to a lot of water damage in a relatively short amount of time. Signs of a water leak from a medium-sized pipe include water spots on walls and ceilings and mold damage. Individuals may also notice hissing sounds or smell water in the air. Small water pipes are often visible under sinks and connected to various water-using appliances. These pipes are prone to corrosion and pinhole leaks. Fortunately, the leaks are often easily found and repaired. Potable water pipes are prone to corrosion, pinhole leaks, cracks, and breaks as they near the end of their useful lives. The exact length of time a water pipe is expected to last vary with the material. In general, you can expect your water supply pipes to last between 20 and 70 or more years. If your pipes are nearing the end of their expected useful lives or you are noticing the need for increasing plumbing repairs, you may want to consider lining your water pipes with either epoxy liners or an epoxy coating. Once your pipes are lined, their useful lives are increased by at least 35 years. To learn more about how epoxy pipe liners and coatings can increase the useful lives of your potable water pipes, call us at 815-790-9000.